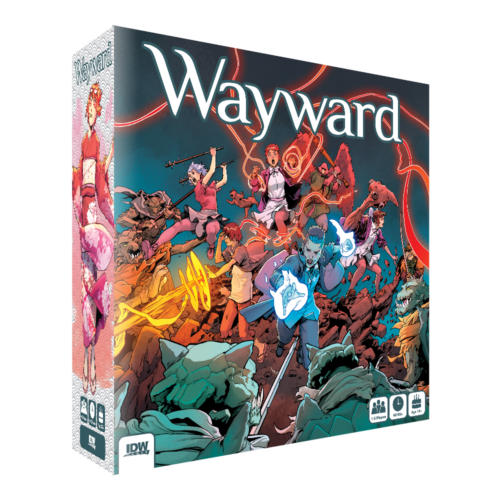 San Diego, CA (May 18, 2017) IDW Games announced today that it is working closely with writer Jim Zub and illustrator Steven Cummings on an upcoming Wayward board game. Designed by Jon Gilmour, co-designer of Dead of Winter and Outpost: Siberia, Wayward is a fully cooperative board game where players assume the roles of the comic’s heroes working together to defeat villains controlled by the game itself. Set in modern Tokyo, Wayward is an ongoing series published by Image Comics featuring teenagers imbued with supernatural power defending the world from Yokai, Japanese mythological creatures and spirits. Since launching in August 2014, Wayward has gained critical acclaim and a dedicated readership. The first volume of the series, “String Theory,” made the Young Adult Library Services Association’s 2016 List of ‘Great Graphic Novels for Teens’ and has been favorably reviewed by many outlets, including Kirkus. In addition, Wayward was recently optioned by Manga Entertainment for development as a television series. Zub is a Harvey and Shuster Award-nominated comic writer (AVENGERS, DUNGEONS & DRAGONS, SAMURAI JACK, FIGMENT), and the creator of the original comic series GLITTERBOMB and SKULLKICKERS. IDW Games is well known for its excellent tabletop adaptations of beloved intellectual properties. Their licensed board games include X-Files, Back to the Future, and the upcoming Planet of the Apes and Atari series of games.